1. 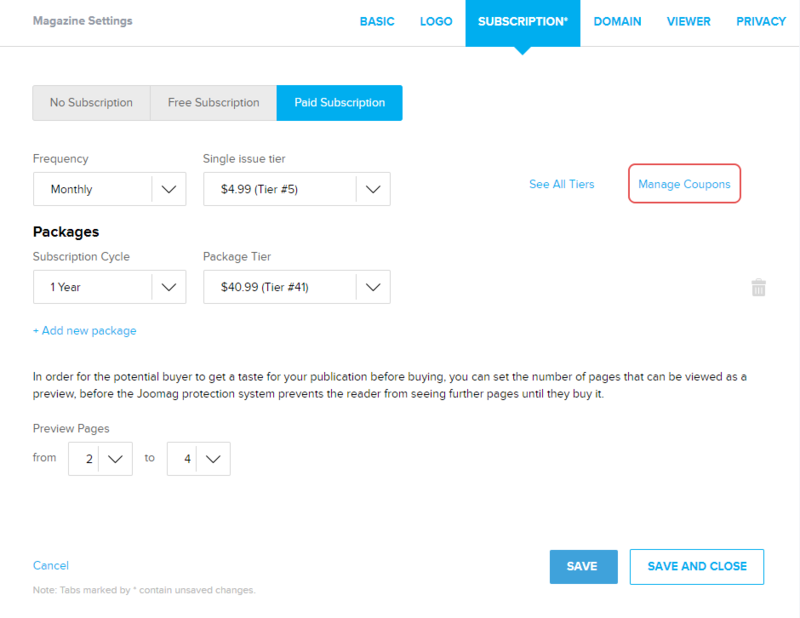 From the My Publications page open the publication you wish and click the Subscription Settings button. Note: For being able to generate coupons you must have a paid subscription activated. Learn more about creating a paid subscription. 2. Click the Manage Coupons link. 3. A new tab will open where you will be able to create your coupons. Click the CREATE NEW COUPONS button. 4. From the Applies to: dropdown menu select the Any Issue option and after that select a publication. 5. Enter the number of coupons you wish to create and the discount percentage of the coupon. If you wish to create a free coupon check the Free box. Note: With the coupon applied the publication subscription cannot cost less than $0.99 USD. Keep in mind that you may also create a free coupon. 6. Select the number of usages and the expiration date of your coupons. Once you're done click the GENERATE button. 7. Your coupons will be generated and you will be able to download them in TXT format or copy and share them from the Coupons panel.